// Between the lines //: It's snowing! 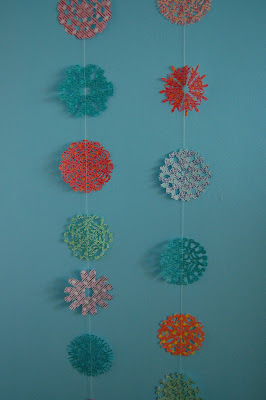 I quickly assembled snow garlands for my girls with the snow flakes we made over the last couple of days. Taking the picture actually took me much (MUCH! )longer than the sewing. The picture still looks horrible, but I gave up! I didn't even notice it was snowing outside until right now!! Can you believe it?! I really should start reading the book I got on how to use my Nikon D40 and get the most out of it... Really!